An unforgettable TOUCH at an unbelievable TOUCH A total of 204 brilliant colors are available and ideal for a diverse range of uses including animation, illustration, architectural renderings, and interior design sketches. With a unique fine point nib on one side and a broad chisel nib on the other, the TOUCH TWIN marker offers artists and designers a greater range of line variation than ever before. The delivery of ink flow can be perfectly controlled to allow precision drawing. The ergonomically designed rectangular body resists rolling on work surfaces and provides a perfect grip that avoids smudges and smears. A specially designed safety cap stacks neatly which prevents damage to the nibs. 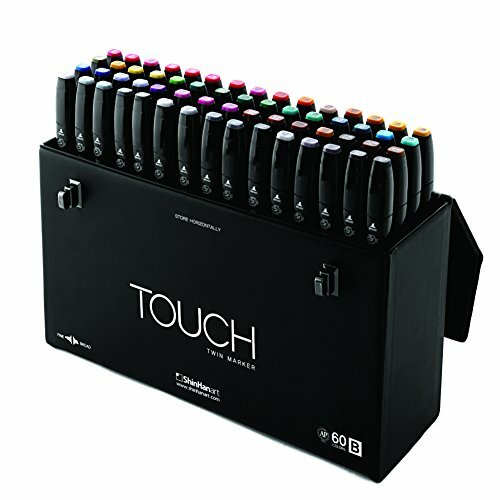 The new TOUCH TWIN marker contains an alcohol-based ink that does not dissolve printed ink toner, allowing for odorless, vividly colored artwork on printed materials. Refillable ink and replaceable nibs are also available for TOUCH TWIN markers. If you have any questions about this product by TOUCH, contact us by completing and submitting the form below. If you are looking for a specif part number, please include it with your message.